Does central bank optimism move financial markets? “Animal spirits”, also called “errors of optimism and pessimism” or “sentiments”, contribute to macroeconomic fluctuations, as has been pointed out by Pigou (1927) and Keynes (1936) and more recently by Angeletos and La’O (2013) . Quantifying these kinds of unobservable concepts is crucial for understanding how economic agents form their expectations and arrive at decisions that in turn influence the economy. In a recent working paper, “Central Bank Sentiment and Policy Expectations”, we examine this issue by analysing central bank communications and assessing their impact on expectations about interest rate markets. Our study aims to quantify the “sentiment” conveyed by central bank communications using the monetary policy statements of the European Central Bank (ECB) and the US Federal Reserve (Fed). We then test whether the optimism or pessimism transmitted in these statements affects the term structure of short-term interest rate expectations. The main challenge is measuring a concept like the “sentiment” of a central bank, which is not very tangible. We first quantified the tone used by the ECB and the Fed in their monetary policy statements by using a computational linguistics approach based on three dictionaries of “positive” and “negative” words . Note that the goal here is not to measure the orientation of the discourse (whether, for example, expansionary or restrictive) but rather to quantify the use of words with a positive or negative tone in order to measure the overall tonality of the speech, regardless of its ultimate message. Sentiment is thus conceived as a component that is independent of economic fundamentals and the monetary policy decisions actually taken . In other words, we look at whether the use of certain words rather than others, regardless of the message communicated, affects the financial markets. 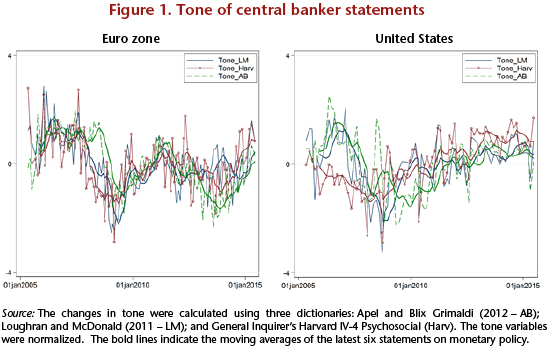 Figure 1 shows changes in the tone of central bank statements, calculated on the basis of the three dictionaries, for the ECB and the Fed from 2005 to 2015. The tone is correlated with the economic cycle: the speech is more optimistic (positive tone) during periods of growth and more pessimistic (negative tone) during periods of recession. Using this measure of tonality, we can see the 2008-2009 recession in the euro zone and the US, as well as the sovereign debt crisis in the euro zone in 2012-2013. The tone adopted by central bankers seems therefore to be the product of a combination of the central banks’ assessment of the current and future state of the economy and of the sentiment that they are conveying. 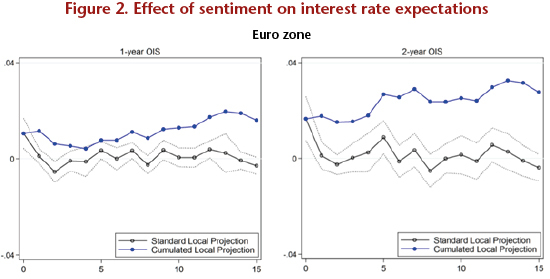 After isolating the “sentiment” component of the variables quantifying the tone, we measured the impact of this sentiment on changes in short-term interest rate expectations, as measured by interest rate swaps (OIS – Overnight Indexed Swaps) for maturities ranging from 1 month to 10 years. Since this sentiment is communicated on the day of the monetary policy decision, we also checked that we are not measuring the effect of the decision itself. Our results show that a discourse with a positive (i.e. optimistic) sentiment has a positive effect on interest rate expectations for maturities ranging from 3 months to 10 years in the euro zone and on maturities from 1 to 3 months and from 1 to 3 years in the United States. The peak effect is for maturities of around 1 to 2 years both in the euro zone and the United States. 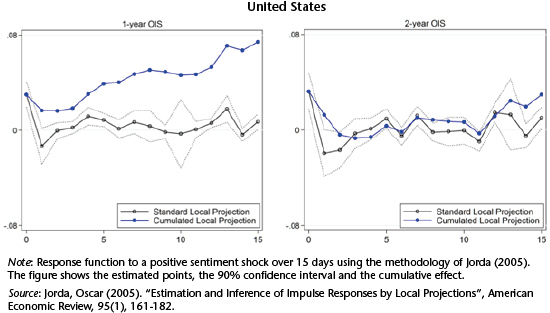 We also show that this effect is persistent and tends to grow over time (see Figure 2). We also find that the impact of the sentiment depends on the precision of the signal, its size and its sign (the effect of pessimism is stronger than that of optimism, for example), as well as on the level of inflation and growth. These results show that market reactions are not due solely to the substance of the message but also to the way that it is expressed by the central bankers. Central bankers’ sentiments influence the formation of interest rate expectations and seem to set the future prospects for rate policy. In a context where observers attentively scrutinize the slightest detail that might reveal the date when the Fed will once again raise rates, this study opens new avenues for research and suggests that it might be useful to test whether the sentiment conveyed in the last speech by Janet Yellen might be a good indicator. Angeletos, George-Marios, and Jennifer La’O (2013), “Sentiments”, Econometrica, 81(2), 739-780 ; Keynes, John Maynard (1936), General Theory of Employment, Interest and Money, London, Palgrave Macmillan; and Pigou, Arthur Cecil (1927), Industrial Fluctuations, London, Palgrave MacMillan. We use three different dictionaries: one by Apel and Blix-Grimaldi (2012) that focuses on the communications of the central banks; one developed by Loughran and McDonald (2011) for a financial context; and the General Inquirer’s Harvard dictionary, which lists positive and negative words used in everyday life. These dictionaries list words or phrases with positive or negative connotations. The difference between the numbers of positive and negative words indicates the tone of the text: if there are more positive than negative expressions, the tone is optimistic, and vice versa. See Apel, Mikael and Marianna Blix-Grimaldi (2012), “The information content of central bank minutes”, Riksbank Research Paper Series, no. 92; Loughran, Tim and Bill McDonald (2011), “When is a Liability not a Liability? Textual Analysis, Dictionaries, and 10-Ks”, Journal of Finance, 66 (1), 35-65; and http://www.wjh.harvard.edu/~inquirer/. Cf. Angeletos and La’O (2013).